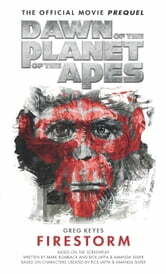 The official movie prequel to the eagerly anticipated *Dawn of the Planet of the Apes *movie, scheduled for release in July 2014. No Planet of the Apes fan should miss out on this original Apes story written byNew York Times bestselling author Greg Keyes, whose previous works include theStar Wars: New Jedi Order novels Edge of Victory I: Conquest, Edge of Victory II: Rebirth, and The Final Prophecy. Bridging the gap between the events of the box office smash *Rise of the Planet of the Apes *and the eagerly anticipated sequel Dawn of the Planet of the Apes, this movie prequel takes readers on a journey through the build up that leads to the action on screen.